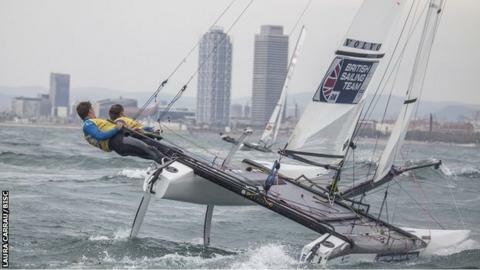 Britain's Ben Saxton and Nicola Groves held off their Australian rivals to win gold at the Nacra 17 European Championships in Barcelona. Groves and Saxton held a narrow lead in the standings going into the sixth and final race of an event that also featured non-European nations. The Britons finished fifth in the medal race, one ahead of Australia, to win. "It was a fantastic race and a really good battle with the Aussies. We're really chuffed," said Groves, 26. Saxton and Groves joined forces in the mixed multihull event a year ago, with Groves switching from the 49er boat class, and won a silver medal at a World Cup event in Miami in January. "We've been working hard over the summer and in the build-up to this event with our coach Maurice, and it's great to see that it's starting to pay off," said Saxton, 25.